Let me be the first to officially wish all of you good luck as we begin to prepare for the upcoming 2017-18 basketball season, and also issue a bold statement: Basketball needs passionate coaches and teachers more than it ever has before. Given recent events in the college coaching community, it is more important than ever that basketball coaches remember why we fell in love with this game in the first place. Basketball is unique in that it has an “offseason” and while that doesn’t exactly mean there’s less work to do, it does offer a time for coaches to focus on personal development. I wanted to touch on why it’s important for coaches to constantly be looking to improve themselves at each and every opportunity, by sharing some of my own story and background. As many of us have, I’ve been fortunate to have worked with, coached with, and played for some tremendous coaches during my basketball life. Working at prestigious basketball camps all over the East coast afforded me the opportunity to learn from some of the top coaches in the game. After embarking on my coaching career at Brooklyn College, fresh from my playing days, I thought I was a hot-shot young coach who knew it all. I felt that I had seen so much in the game of basketball that I was more than prepared to be a head coach and run my own program. When I was hired as the Head Boys Varsity Basketball Coach of Adams Street Academy HS in Brooklyn, NY, I quickly learned how wrong I was. I knew NOTHING about basketball compared to what I needed to learn. It was much easier, I realized, to work with collegiate athletes who had been well coached, rather than with young adolescents who had never played the game before. Running a practice as a college assistant coach, using your head coach’s practice plan and routine, was much simpler than it was to develop a practice plan of your own. And suggesting a substitution, play call, timeout, or strategy as an assistant is a lot different than actually having to make the final decision as a head coach that may impact the game one way or the other. It certainly is easier to work in a program that already has its own culture than it is to learn how to develop one at a program that has never had it. Ultimately, what I have come to learn during my two years as a head coach, through all of the successes and failures of my program, is that coaches can NEVER stop developing. Any coach who thinks he or she knows it all, that their way is the only way, that they don’t need to change, will quickly find out how very mistaken they are. Far too many coaches, I feel, are afraid to ask for help, to seek out help, to do whatever is needed in order to improve themselves. Sure, there are thousands of videos out there and those can be great resources. There are countless books and guides that are helpful as well. But when you use those resources, you can’t ask questions, you can’t debate or discuss. You can’t share your point of view with the presenters. With coaching clinics, you can do these things, and that’s why they are so valuable as a development opportunity. Unfortunately, while there are many clinics available out there, access is the issue. 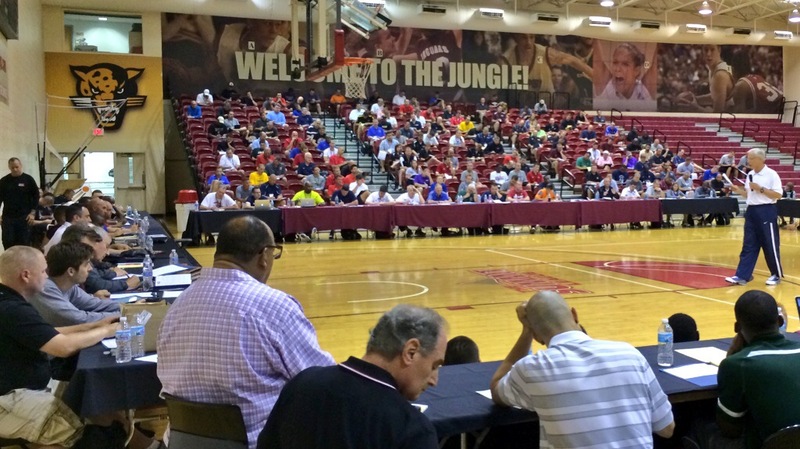 Many clinics are headlined by tremendous college coaches, but usually cost $100 or more. These clinic fees can be steep for the coaches at the youth level, high school level, and even for some at the small college level. Most program budgets are tight enough, stretching to purchase necessary items, let alone professional development opportunities for the staff. In recent years, I have seen some more clinics being put together that are either free or more affordable for coaches to attend. For example last fall, FastModel put on a a free virtual coaching clinic featuring Tim Miles of Nebraska and Tara VanDerveer of Stanford as guest speakers, which was attended by over 700 coaches. Last year, in an effort to find ways to fundraise for my program (which does not have a budget allocated by the school), while also helping other coaches grow their knowledge of the game, I had the idea to organize my own coaching clinic. I arranged for some of the best high school and college coaches in the NYC area to come speak, providing a tremendous learning and networking opportunity for all coaches who attended. Keeping the cost low was my number one goal, and we achieved it by only charging $25. All money raised went directly toward operating costs for our program. It was a great success, and I was able to serve others while helping out my program. It felt amazing to give back to the basketball coaching community in the NYC area. With that said, I’m happy to announce I am hosting my second annual coaching clinic on Monday, October 9 (Columbus Day) in Brooklyn, NY. All coaches are invited to come learn and network as we prepare for the upcoming season. Please see the attached flyer for more details. It’s my hope that coaches take improving their craft seriously, and that we as a collective coaching community work for better access to development opportunities. Speak to other coaches, attend other teams practices, reach out to a mentor, build a playbook, study a new offense or defense, learn a technology (like FastDraw). Do whatever you can to constantly challenge yourself so that you can teach this next generation of coaches and players. Register for the clinic via Eventbrite here. Feel free to reach out to me directly (coachbshea@gmail.com or 718-968-5965) with questions about the clinic, or for tips on running your own in your local community. Brian Shea is the head varsity coach at Adams Street Academy High School. He coached at Brooklyn College from 2011-2015, where he also played from 2007-2011, serving as team captain and winning two CUNYAC Championships. Shea has a passion for growing the game of basketball by connecting with his peers, and believes in constant learning and development of his craft. Kevin Eastman speaks to an audience at a COACHING U Live clinic.